3D printing continues to rock the manufacturing industry. Now more than ever, organizations are viewing this technology as the silver bullet they’ve been waiting for. In fact, 90 percent of respondents consider 3D printing as a competitive advantage in their strategy, per the third annual edition of "The State of 3D Printing." And, it’s obvious why. The promise of the 3D printing technology is undeniably compelling. Accelerating product development, increasing production flexibility and driving customization all equates to money and time saved. The on-demand, scalable capabilities are every organization’s logistical dream: decentralize manufacturing. Done right, 3D printing can close the gap between consumer and manufacturer. While the industry has much promise, there’s much work to be done. The full breadth of the applications of 3D printing is still being realized. We’re just seeing the "tip of the iceberg" with the technology’s capabilities, according to Tyler Brown, Kforce Strategic Accounts Executive. To date, we’ve seen notable progress in what 3D printing can do across various industries, from building airplane parts for the armed forces to reconstructing the human face after a car accident. While the enthusiasm for 3D printing continues, the proverbial phrase coined by Marshall McLuhan “the medium is the message” still holds true. It's the technology's inherent ability to create and test that pushes boundaries and opens doors of opportunity. The key to unlocking 3D’s potential is mastering the customization of print materials; like cost-effective prototyping filaments, testing extrusions and material for end-production models. As a result, material companies are lining up and the cutting-edge companies are partnering with 3D printing pioneers like HP to discover what lies beyond the horizon for manufacturing. “They can change the game in something common as a shoe so that everybody has to buy them,” Brown said referencing Nike’s recent engagement with HP in making 3D printed footwear. “Also, what is novel is the industry that they are going after – these are commercial 3D presses, going after the manufacturing industry,” said Ryan Henthorne, Kforce Client Relation Director. Henthorne also noted the trend of companies like HP pushing 3D printing forward by using open source to innovate. “Similar to an app store for software, HP envisions having that same open-sourced concept applied to certified materials that can be 3D printed,” said Henthorne. 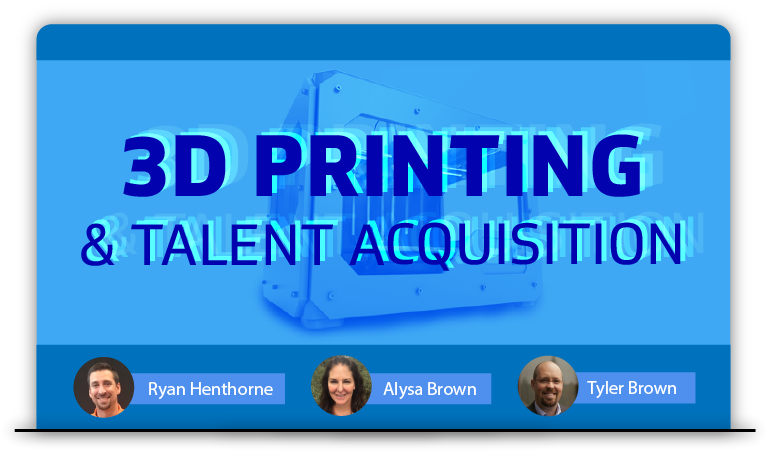 “This greatly expands the capabilities of a 3D printer and its implications in the manufacturing industry.” To fuel this innovation, talent acquisition for organizations has become a priority. For 3D printing to continue to evolve, companies must recruit the right talent. Without the right people at the wheel, the ship will never leave the harbor. Similar to the advent of the first computer, employers need the right talent to make the promise of 3D printing become a reality. And, this initiative proves challenging for newcomers as a skills gap for 3D printing continues amid a growing STEM talent gap, a changing workforce and a shortage of training programs. According to a PwC Survey, 2 out of 3 manufacturers report difficulty in finding highly skilled workers. 3D printing requires highly skilled professionals with technical backgrounds. Scuplteo reports “97 percent of candidates being sought are technical recruits” with an average of 1 to 2 years of experience. Highly educated professionals with graduate-level degrees are also in high demand for the growing industry. Nearly 75 percent of jobs in general manufacturing are being filled by candidates with post-secondary education, according to PwC. “When we find [candidates with] PhDs, there isn’t much competition,” said Alysa Brown, Kforce Client Relation Director. Education backgrounds across various disciplines are applicable in this burgeoning industry, including material science, applied science, manufacturing, biotech, 3D modeling, software development and auto mechanics. As companies continue to explore additive manufacturing, organizations are searching for specialized, professional talent to operate, engineer, design, and manage functions related to 3D printing. However, the most noteworthy trait needed for this industry that continues to break the mold is individuals who are willing to do the same – discover applications.